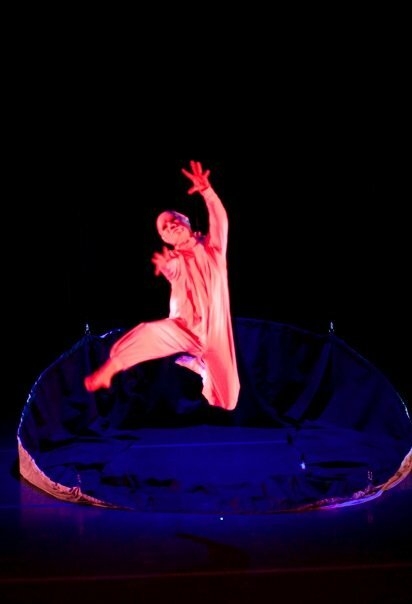 This website is a project of Washington DC aerial performance artists Ann Behrends and Sara Deull with the support of Jonathan Deull. We are proud to part of an emerging community of aerial performers, students and teachers in the Washington DC area, and have put together this site as a resource and directory. We can be reached by email at info@airbornedc.org or by telephone at 202 232-4138. 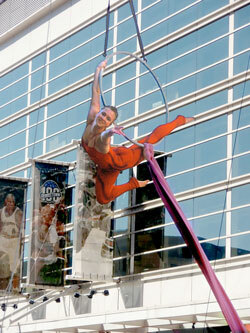 Special thanks to Baltimore-based Air Dance Bernasconi for the use of many of the photographs on these pages. featured as part of INTERSECTIONS at the Atlas Performing Arts Center. But wait, there’s more. When you come see the show you too can join the circus, with free participatory activities for kids in the ATLAS lobby from 11:00am to 3:00pm, and a special Zip Zap Circus for Life workshop for adults between 3:30pm and 5:00pm, free for show ticketholders. 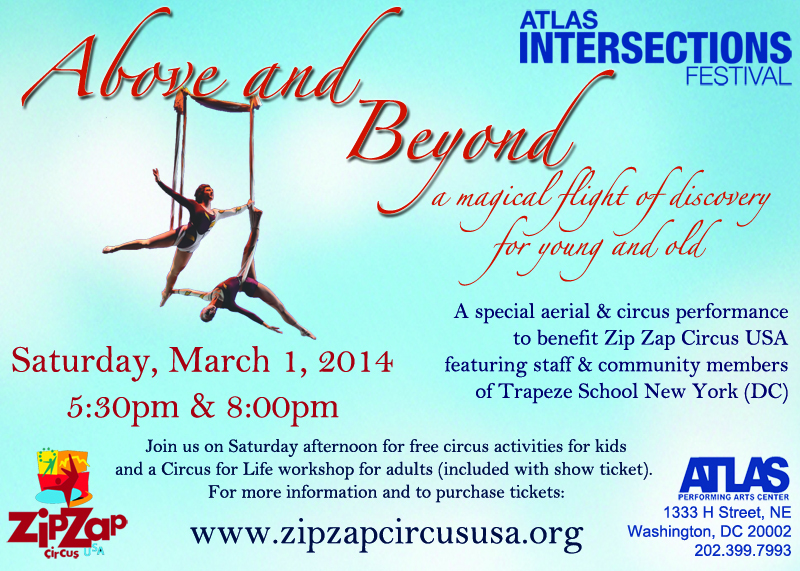 For more information, contact the ATLAS box office or email us at: info@zipzapcircususa.org. 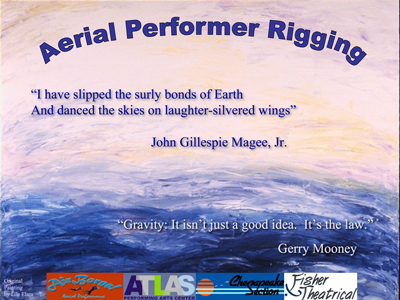 Jonathan Deull and Delbert Hall conduct hands-on aerial rigging workshops for professional theatrical riggers, coaches, choreographers, facility managers and performers. For information, contact: info@airbornedc.org Click here or on the image to see photos from some of our workshops. For the third year in a row, AirBorne! 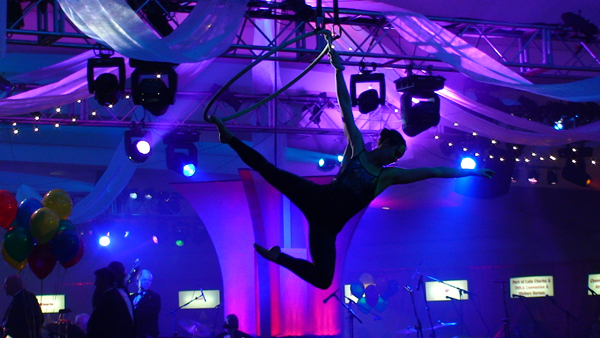 DC performers provided spectacular entertainment for the gala Louisiana Alive celebration at the Washington DC Hilton. Click here or on the image for some photos. Arts on Foot Takes to the Air -- Again! 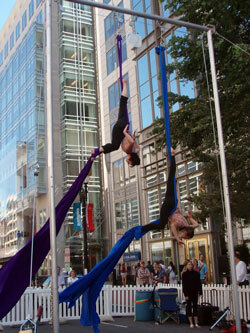 DC's annual Arts on Foot street festival got a lift this year with crowdstopping performances by AirBorne artists Ann Behrends, Jayne Bernasconi, Lizzie Cavenaugh-Broad, Nina Charity, Guido DiSalvo , LeeAnn Lenhart, Jessica Mislevy, and Carey Nagoda. On Saturday, April 26, 2008, AirBorne! 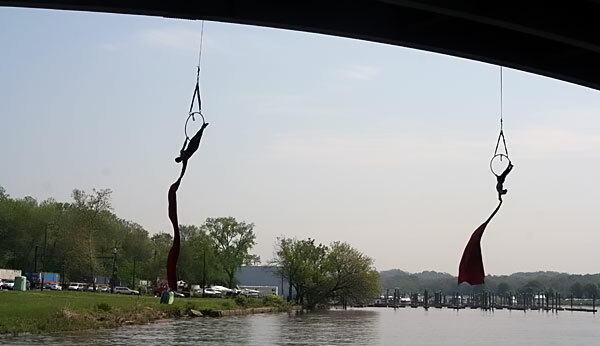 DC aerialists Ann Berends and Sara Deull performed suspended from the Pennsylvania Avenue Bridge over Washington, DC's Anacostia River as part of the Anacostia Watershed Society's Earth Day Rally and Celebration. 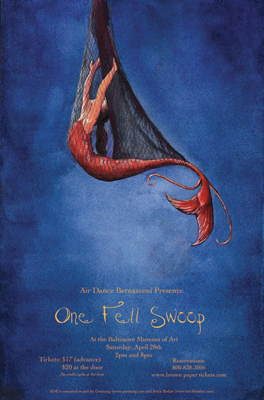 On September 29, 2007 Jayne Bernasconi recreated Alwin Nikolais' Sorceror, one of the first aerial modern dance pieces (originally choreographed in the 1960s) as part of the Art of the Solo Show at the Baltimore Museum of Art. More information is available at www.theartofthesolo.org. AirBorne DC! 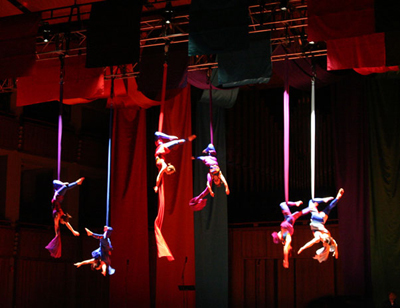 aerialists Ann Behrends, Sara Deull, Blair Lee, Moira Lee, Stephen Lee and Tiffany Race provided a dynamic opening for the 22nd Annual DC Mayor's Arts Awards at the Kennedy Center Concert Hall on March 19, 2007. Choreographed by Ann Behrends to the music of Benny Goodman and his Orchestra, the five-minute piece was webcast live as part of the Kennedy Center's Millennium Stage program and can be viewed online at the Millennium Stage website or by following link: www.tinyurl.com/28st45. © 2008 Ann Behrends and Sara Deull, all rights reserved.